KCKCC – Page 464 – Welcome to Wyandotte Daily! Of the many good things to come out of the 2014 annual Keith Lindsey Classic, the fact both Kansas City Kansas Community College teams can go deep into their benches was one of the best. The 18th ranked Lady Blue Devils rolled to a 96-57 win over longtime rival Penn Valley Saturday after a 93-41 thumping of Ellsworth on Friday while the KCKCC men held off St. Louis Community College 78-70 after a 76-73 overtime win over On Point Hoops Academy Friday. Both teams return to action Tuesday, the KCKCC women (4-0) at Saint Mary JV and the Blue Devil men (5-0) at Iowa Western. Both games are at 7 p.m. The Lady Blue Devils then return home this weekend, playing host to Jefferson Friday at 7 p.m. and Wentworth Saturday at 4 p.m., while the KCKCC men play Dodge City Friday and Neosho County Saturday in the Dodge City Classic. Ahead 44-22 at halftime, the Blue Devils led St. Louis by as many as 24 points early in the second half and still had a 19-point lead with 6½ minutes left when a rash of turnovers opened the door for a big St. Louis comeback. Limited to one of four free throws and guilty of seven turnovers in a five minute span, a 69-50 KCKCC lead was trimmed to 70-66 and it took a desperation 3-pointer by backup guard Roberto Hernandez as the clock was about to expire with 1:32 left to stem the Archers’ comeback. Still, St. Louis got to within four at 74-70 before two Hernandez free throws sealed the win with 32 seconds left. Lansing freshman Joe Lendway led KCKCC with 16 points on seven of nine shots along with five rebounds while frosh Braseson Sester and Austin Hall each scored 13 points and had five rebounds off the bench, which provided 37 points. Ray Ridley had four assists to go along with his 10 points for KCKCC, which shot a torrid 62.5 percent the first half. However, the Blue Devils were guilty of 21 turnovers, 14 in the second half. Six Blue Devils scored eight or more points in the 76-73 overtime win over On Point highlighted by an 11 point, 10 rebound double double by freshman Tevin Downing. Lendway again led with a career high 19 points while Ridley added 11, C.J. Vallejo 10, Clay Young 9 and Hall 8. Vallejo also had eight rebounds and five assists, four in overtime as Downing had a 3-pointer, Lendway a layup and Young two key field goals including a 3-pointer. A triple double by sophomore guard Cassidy Harbert, the second of her career, highlighted KCKCC’s 96-57 win over Penn Valley. Harbert had 14 points, 14 rebounds and 12 assists while freshman Cheyenne North had a big double double with 12 points and 15 rebounds. Cierra Gaines led the scoring with 23 while Janai Mitchell added 12 points and Sierra Roberts 11 and seven rebounds. Gaines also had six steals and Erin Anderson five as KCKCC forced 26 turnovers. Eleven Blue Devils scored and collected rebounds as KCKCC had a 66-30 rebound superiority. The Blue Devils had 13 score and grab rebounds in the 93-41 win over Ellsworth. North had 14 points and Mitchell, Harbert and Gaines 13 each in the win. Leading 40-28 at the half, KCKCC outscored the Panthers 53-13 in the second half. Alan Hoskins is the sports information director for KCKCC. Kansas City Kansas Community College’s basketball teams gave their fans their money’s worth in the opening round of the 11th annual Keith Lindsey Classic Friday. The Lady Blue Devils looked every bit their national ranking in the second half in a 93-41 win over Ellsworth Community College while the Blue Devil men provided the drama, winning a 76-73 overtime thriller over On Point Hoops Academy that went right down to the final shot not once but twice. KCKCC led the men’s game by nine points midway through the second half only to have On Point go ahead 55-54 with four minutes to go. Freshman Tevin Downing regained the lead for KCKCC with a 3-pointer with 3:28 left and soph C.J. Vallejo kept the Blue Devils in front 61-56 with a pair of free throws and a field goal. But three straight misses from the foul line opened the door for a pair of On Point 3-point goals by Nick Treleaven and Ty Hawkins, the one by Hawkins a spectacular 35-footer as time expired. The Blue Devils (4-0) trailed only momentarily in overtime, thanks to the passing of Vallejo, a former Bishop Ward standout. Downing put KCKCC ahead to stay 65-64 with a 3-pointer; Clay Young drilled a baseline jumper and a 3-pointer; and Joe Lendway broke loose for a layup and all four field goals came on assists from Vallejo. However, the lead was never more than three points and it took two Ray Ridley free throws with 10 seconds to clinch it – but only when Deshon Bell’s desperation 3-pointer to tie rimmed out at the horn. Six Blue Devils scored eight or more points with Lendway leading with a career high 19 points and six rebounds while Downing had his second double double of the season, 11 points and 10 rebounds. Ridley notched 13 points and a game high seven assists; Vallejo had 10 points, eight rebounds and five assists; Young nine points and Austin Hall eight points and five rebounds. Former Blue Devil Delondre Williams had 13 points and 12 rebounds for On Point. Janai Mitchell scored 12 of KCKCC’s first 17 points as the Lady Blue Devils surged to a 26-9 lead only to have Ellsworth close to 40-28 at halftime behind 48 percent shooting. However, the Blue Devils erased any chance of another Panther comeback by scoring the first 24 points of the second half for a 64-28 lead. Thirteen Blue Devils scored for the 18th ranked Blue Devils (3-0). Cheyenne North had 14 and Mitchell, Cassidy Harbert and Cierra Gaines 13 each in the well-balanced attack. Erin Anderson led in rebounds with nine while Gaines and North eight each. North also had six assists, Anderson five and Harbert four. 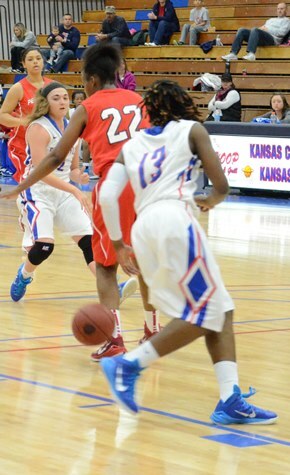 KCKCC had 18 steals in the game including four each by Sierra Roberts and Mitchell. A mobile food pantry from Harvesters is scheduled to be at the Kansas City Kansas Community College Technical Education Center, 6565 State Ave., today. Place: KCKCC-TEC (the old Walmart) parking lot, 6565 State Ave.
Sponsors: Harvesters, Catholic Charities of Northeast Kansas and KCKCC. What: Food will be given away on a first-come, first-served basis. The food items include fresh fruit and vegetables. There are no income restrictions; the food will be given away as supplies last. Quantities will vary according to the number of people in the family. Those receiving the food may line up in the KCKCC-TEC parking lot prior to the distribution. Future food distributions will be at 1 p.m. Dec. 13 and Dec. 20 at KCKCC-TEC.